The price per square foot of large homes in Coral Gables exhibits a rise and fall like the rest of the Miami market. 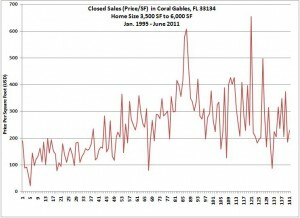 The charts below depict sales of houses between 3,500 and 6,000 square feet, in zip code 33134 (the northern part of Coral Gables, in the vicinity of Miracle Mile and the Biltmore Hotel), from January 1995 to June 2011. During the bubble, prices went ballistic, but sales dried up — one of the classic signs of a top in the real estate market. 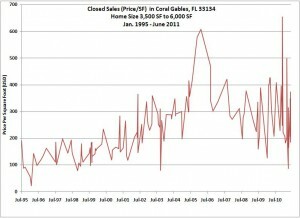 Now that prices have receded to a range in line with the 2002-2004 period, sales have come back. When the bubble began in about 2000, the norm of annual mid-single-digit price increases gave way to the mania of annual price increases ranging from 15% to 25%. The 2002-2004 price range was excessive at the time, but with nearly a decade to work off that excess, the same prices may be defensible here in 2011. In other words, trendline single-digit appreciation has more or less caught up with the boom-and-bust trajectory of Coral Gables home prices. Of course, mean-reverting asset prices sometimes overshoot to the downside, so there’s no guarantee against further declines. Displaying the sales in a one-by-one series rather than by date makes it easier to see the trajectory of prices in times of increased sales activity, like the recent post-bubble period. 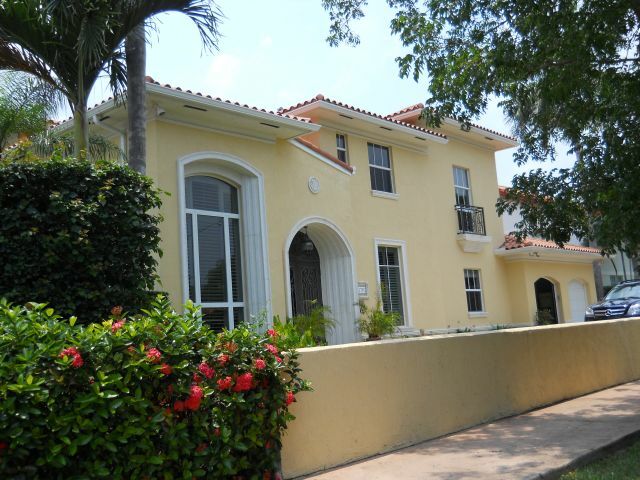 As noted previously, big old houses in Coral Gables have been selling for about $200 per square foot. What about big new houses? One of those will cost you quite a bit more, if recent sales are any indication. The luxury home at 3716 Durango Street sold for about $375/sf, and the luxury home at 2000 North Greenway Drive (which has a golf-course view) sold for about $425/sf. A premium for new construction may be worth paying to avoid the delay and disruption of renovations. But are new homes really worth $200 per square foot more than existing homes? That’s almost the cost of building from the ground up.